Zucchini or courgette is one of summer’s very best vegetables. They are easy to prepare and can transform into a light and fresh meal in a flash—just the thing for hot summer nights. You can grill, roast, stuff, sauté, bake, or raw, zucchini is undeniably versatile. How to Select the Best Zucchini? You can select the freshest and best tasting zucchini by looking for ones that are heavy for their size, firm and have shiny, unblemished rinds. 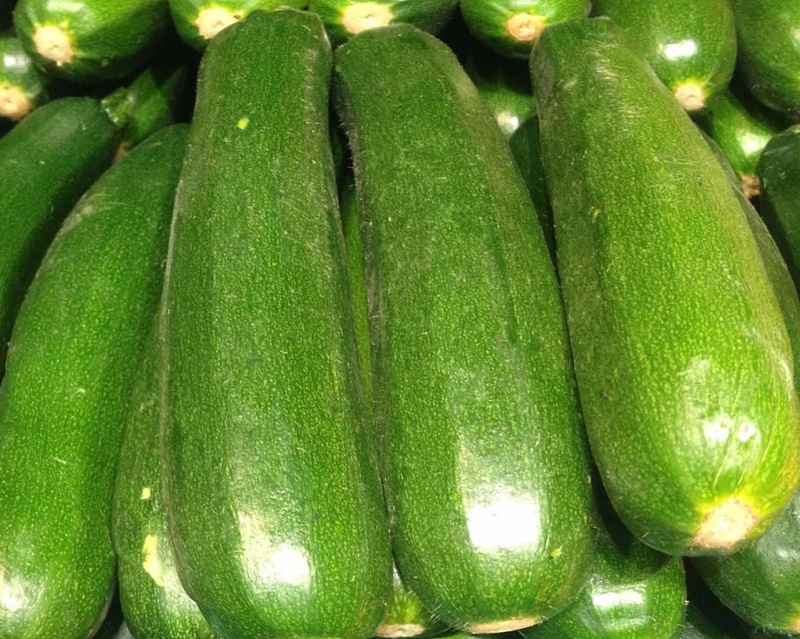 Small zucchini that are less than 6 inches long have fewer seeds and a sweeter taste. By choosing the best tasting zucchini, you will also be benefit from zucchini with the highest nutritional value. As with all of vegetables, nutrition experts recommend selecting organically grown varieties whenever possible. Avoid large, overly mature or small, immature zucchini. Overly mature zucchini has a hard outer rind with large seeds and stringy flesh. Overly small or immature zucchini tends to be mediocre or inferior in taste. What are Zucchini Benefits for Weight Loss? In terms of nutrient content density, ordinary people would not include zucchini on their list of "super food vegetables”. Much more likely to be included in this list would be vegetables like broccoli or kale or spinach. However, zucchini is a vegetable with remarkable nutrient content density that spans all nutrient categories: vitamins, minerals, macronutrients (like fiber and protein) as well as phytonutrients like carotenoids. In terms of macronutrients, zucchini is an impressive source of both protein and fiber. In the case of dietary fiber, we are talking about 2.5 grams per 1 cup serving and only 36 calories. Zucchini is an outstanding source of the phytonutrients lutein and zeaxanthin, a pair of carotenoids that act as potent antioxidants. It is a best food to add to your healthy diet especially if you are interested in weight loss or maintaining your healthy weight, because it is not only high in important nutrients, but also very low in calories. One cup of zucchini contains only 36 calories. It is filled with nutrients, providing over 10% of the daily value for 5 nutrients—manganese, vitamin C, vitamin A, magnesium and dietary fiber. It is noteworthy to see the number of B-vitamins provided by zucchini in good quantity. These B-vitamins include B1, B2, B3, B6, pantothenic acid, choline, and folate. Other vitamins provided by zucchini in good quantity include vitamin C and vitamin K.
5) Promotes bone health. It is a very good source of magnesium and phosphorus, two minerals important for strengthening the bone matrix. It is also an excellent source of manganese and a very good source of copper, two trace minerals that are cofactors of enzymes necessary for bone metabolism. This recipe can be your everyday snack or side dish. Or it can be munchies for your Game Night. The zucchini is thick cut and perfectly crunchy and baked. You can dip this yummy zucchini fries in homemade smoked tomato ketchup. Kids and adults will definitely like this! I adapted this recipe from Chrissy Teigen’s cookbook- Cravings. I like this cookbook. It's full of things you can actually want to eat. 2) In a wide, shallow bowl, combine the flour, cayenne, 2 teaspoons salt, and ½ teaspoon black pepper. In another wide, shallow bowl, whisk the eggs to combine. 3) In a third bowl, stir together the panko, Parm, and olive oil with a fork until incorporated. 4) One at a time, roll the zucchini in the flour mixture. Shake off the excess, and then dip in the egg, allowing the excess to drip back into the bowl. Dip in the panko coating, pressing on all sides to coat (especially the green, rounded side, which can be slippery—just make sure the crumbs are pressed in there! ), and arrange on a baking sheet. 5) Bake until golden, 20 to 25 minutes. Season to taste with salt and pepper. 6) Serve with one of the dressings as a dipping sauce. 1) Due to its high water content, raw zucchini does not freeze well. 2) It is best not to peel zucchini because the skin contains powerful carotenoid antioxidants, including lutein, which have many health-promoting benefits. 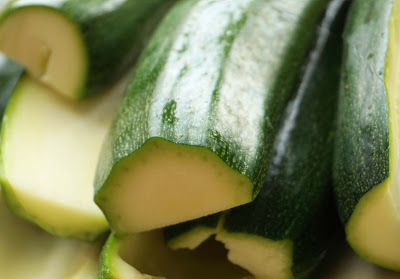 3) Cutting zucchini into slices of equal thickness will help them to cook more evenly. Slicing them thin will help them to cook more quickly. 4) It is important not to overcook zucchini. One of the primary reasons that cooked zucchini loses its flavor is because it is overcooked. For the best flavor, professional cooks recommend cooking zucchini al denté. 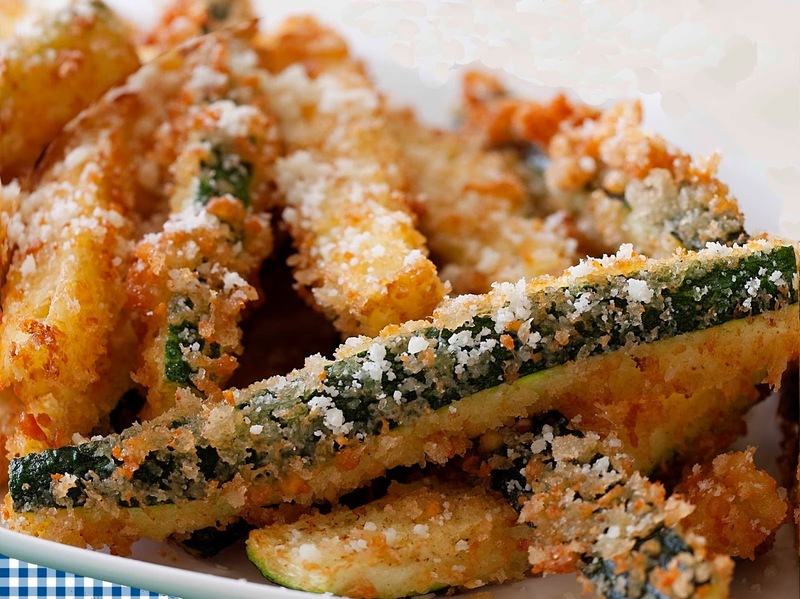 Zucchini cooked al denté is tender and cooked just long enough to soften its cellulose and hemicellulose fiber. This will make it easier to digest and allows its health-promoting nutrients to become more readily available for absorption. If it is cooked for as little as a couple of minutes longer than al denté, it will begin to lose not only its texture and flavor, but also its nutrients. 5) To preserve nutrients, do not soak zucchini cut zucchini or its water-soluble nutrients will leach into the water. 6) Buy organically grown zucchini allows you to enjoy the skin without concern over pesticide residues. 1) In a food processor or blender, combine the mayo, garlic, Parm, lemon juice, Sriracha, anchovy paste, mustard, Worcestershire sauce, salt, and pepper and process until smooth. 2) Refrigerate until ready to use. The dressing will keep in the fridge for 2 weeks. 1) In a small bowl, stir together the mayo, buttermilk, mustard, honey, oregano, garlic powder, onion powder, paprika, cayenne, salt, and black pepper. 2) Refrigerate until ready to use. Learn… How to Store Zucchini Long Term and Keep it Fresh Longer? Blanco-Diaz MT, Del Rio-Celestino M, Martinez-Valdivieso D, et al. 2014 December 1. Use of visible and near-infrared spectroscopy for predicting antioxidant compounds in summer squash (Cucurbita pepo ssp pepo). Food Chem. 164:301-8. Damiano R. Cai T, Fornara P, Franzese CA, et al. 2016 July 4. The role of Cucurbita pepo in the management of patients affected by lower urinary tract symptoms due to benign prostatic hyperplasia: A narrative review. Arch Ital Urol Androl. 88 (2):136-43. Hamissou M, Smith AC, Carter E Jr., et al. September 2013. Antioxidative properties of bitter gourd (Momordica charantia) and zucchini (Cucurbita pepo). Emirates Journal of Food and Agriculture; Al-Ain25.9. 641-647. Martinez-Valdivieso D, Font R, Gomez P, et al. 2014 December. Determining the mineral composition in Cucurbita pepo fruit using near infrared reflectance spectroscopy. J Sci Food Agric. 94(15):3171-80.